Meet Some Amerks' Players Tonight · Let's Go Amerks! Every season, the Rochester Americans’ players go out on the town to many different places for fans to meet them and strike up a conversation or two. I always enjoyed bringing my son to these events, he loves the events and always thinks it’s a great time to get to talk to his favorite hockey players. 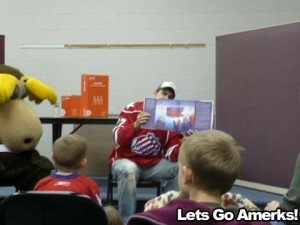 First there is the best program that the Amerks offer the community (in my opinion), the “Reading PowerPlay” program. A player and the Moose go to an area library and reads the children there a book. Then, the player gives a demonstration of all the hockey equipment that the players have to wear during every game. A child gets to go up and try it all on, which is always a funny site. They then have a signing where the kids can each get up close with the player and the Moose. Tonight, Rory FitzPatrick will be the player visiting the West Irondequoit Library at 7:00pm. Don’t forget that the Reading Power Play is a way to get your Mooseketeer some points. Don’t miss out on a chance to get your kids really interested in reading at a young age. Last year, when my son was three, we took him to as many library appearances as our schedules would allow. He fell in love with the book they read (Z is for Zamboni). When he got it for Christmas, it was his favorite present. He still has me read it to him at least once a week. Also tonight, a few Amerks’ players make their first trip over to the Charbroil House for dinner. This is a part of their “Pucks and Plates” promotion. This is the second year the Amerks and the Charbroil House are coming together to do this. Tonight Brady Calla and Michael Caruso will be at the Charbroil House at 6:00pm. They will be signing autographs and will be raffling off an autographed team stick. I thought this would have been a little better last season if the players didn’t make themselves a bit unapproachable. Hopefully this season they will make the players not stick to themselves so much. We will find out tonight! Lastly, tonight Drew Larman will be at Lakeshore Ice Rink walking around talking to hockey players, parents and fans. I am not sure the time that he will be there because no matter how hard I looked, I couldn’t find it. I am going to have to assume it will be around 6:00 or 7:00pm because that is when the Amerks do most of their apperances. If you can’t make it out tonight there will be plenty of times when you can see them throughout the season. We’ll have a calendar up shortly!